Just in case someone told you that Einstein was religious, or that he believed in God, you need to read his real quotes below. This should put an end to that. Not only did he not believe I god, he was very articulate, even poetic about it. However, I do think he believed in Pi. His quotes are from Freedom From Religion Foundation (ffrf.org). You should join and get these Freethought of the Day bios and quotes like I do. Confusion over his beliefs stemmed from such comments as his public statement, reported by United Press in April 25, 1929, that: “I believe in Spinoza’s God, who reveals himself in the orderly harmony in being, not in God who deals with the facts and actions of men.” Einstein’s famous “God does not play dice with the Universe” metaphor—meaning nature conforms to mathematical law—fueled more confusion. At a symposium, he advised: “In their struggle for the ethical good, teachers of religion must have the stature to give up the doctrine of a personal God, that is, give up that source of fear and hope which in the past placed such vast power in the hands of priests. In their labors they will have to avail themselves of those forces which are capable of cultivating the Good, the True, and the Beautiful in humanity itself. This is, to be sure a more difficult but an incomparably more worthy task . . . ” (“Science, Philosophy and Religion, A Symposium,” published by the Conference on Science, Philosophy and Religion in their Relation to the Democratic Way of Life, Inc., New York, 1941). 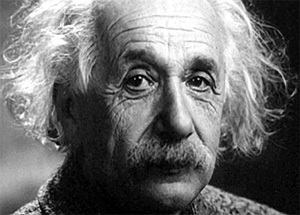 In a letter to philosopher Eric Gutkind, dated Jan. 3, 1954, Einstein stated: “The word god is for me nothing more than the expression and product of human weaknesses, the Bible a collection of honorable, but still primitive legends which are nevertheless pretty childish. No interpretation no matter how subtle can (for me) change this,” (The Guardian, “Childish superstition: Einstein’s letter makes view of religion relatively clear,” by James Randerson, May 13, 2008). D. 1955.